An original drawing from the landmark Mickey Mouse cartoon Steamboat Willie will lead a sale of animation art at Heritage Auctions next week. Released in November 1928, the animated short marked the first appearance of Walt Disney’s iconic character, and is regarded as a seminal moment in animation history. The drawing has been described as “a Holy Grail piece of Disney animation art”, and is expected to sell for more than $10,000 when it hits the auction block in Dallas on December 8-9. “No one can deny Mickey’s importance in film and animation history and in the pop-culture fabric of the United States and the world,” said Jim Lentz, director of animation art at Heritage Auctions. The production drawing is by Disney’s creative partner Ub Iwerks, who co-created Mickey and animated the majority of his early cartoons. 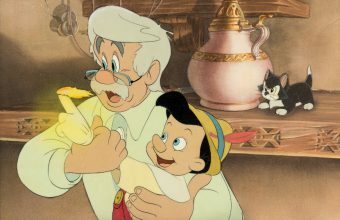 It features Mickey Mouse and his early nemesis Peg Leg Pete, during a scene towards the end of the cartoon in which Pete throws Mickey in the bin to peel potatoes. 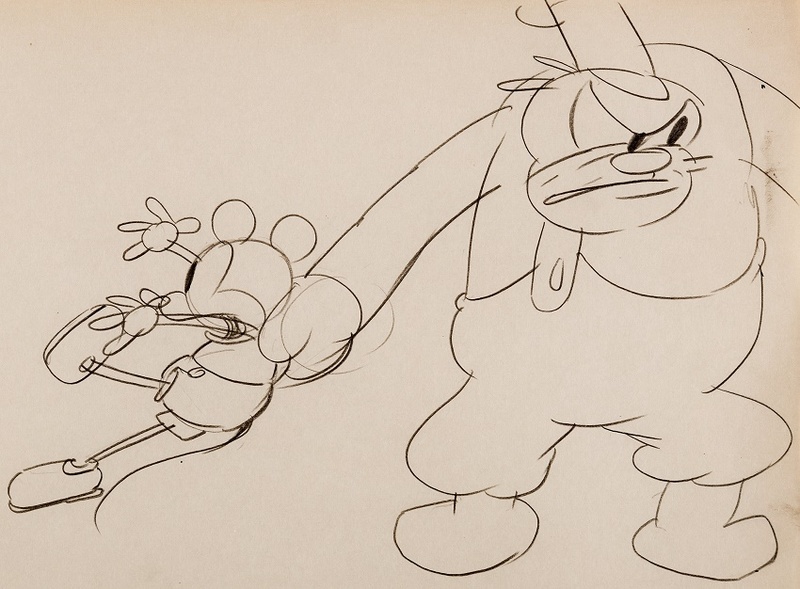 Although Iwerks’ production drawings of Mickey Mouse have occasionally been offered for sale in the past, this example is highly rare in that it features both Mickey and Pete in the same frame. 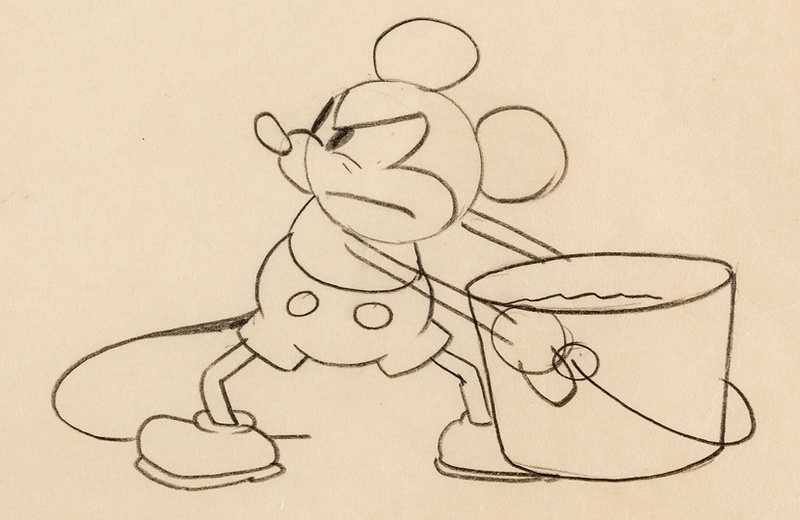 Two further drawings from the film featuring Mickey on his own will also cross the block; a shot of him playing a cow’s teeth like a xylophone, and a moment in which he throws a bucket of water at a laughing parrot. Steamboat Willie premiered on November 18, 1928 at the Colony Theater in New York, and made history as the first cartoon to feature a fully post-produced soundtrack. 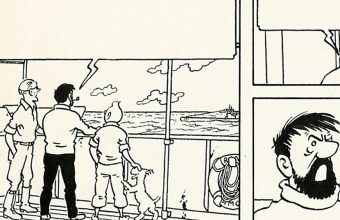 It was critically acclaimed, and marked the public birth of animation’s most famous character – but technically it wasn’t his big-screen debut. Six months earlier on May 15, a lucky audience in Los Angeles had witnessed a milestone in cartoon history, even if they didn’t realize it at the time. They were shown a test-screening of a silent short featuring a mouse who builds an airplane to impress his girlfriend, whilst its director sat nervously taking notes in the back. The film was Plane Crazy – the first Mickey Mouse cartoon ever produced – but despite a positive reaction it failed to find a distributor. 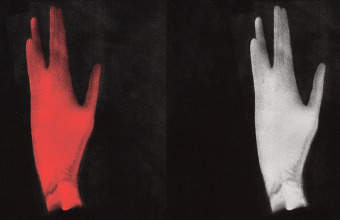 Walt Disney went back to the drawing board, and realized that audiences wanted their cartoons to feature synchronized sound, following the release of The Jazz Singer the previous year. After Steamboat Willie proved to be a hit, he went back and added sound to Plane Crazy, and it was finally released as the fourth Mickey Mouse theatrical short in March 1929. Collectors will also have the chance to get their hands on two rare production drawings from the film, which was initially inspired by the feats of aviator Charles Lindberg. 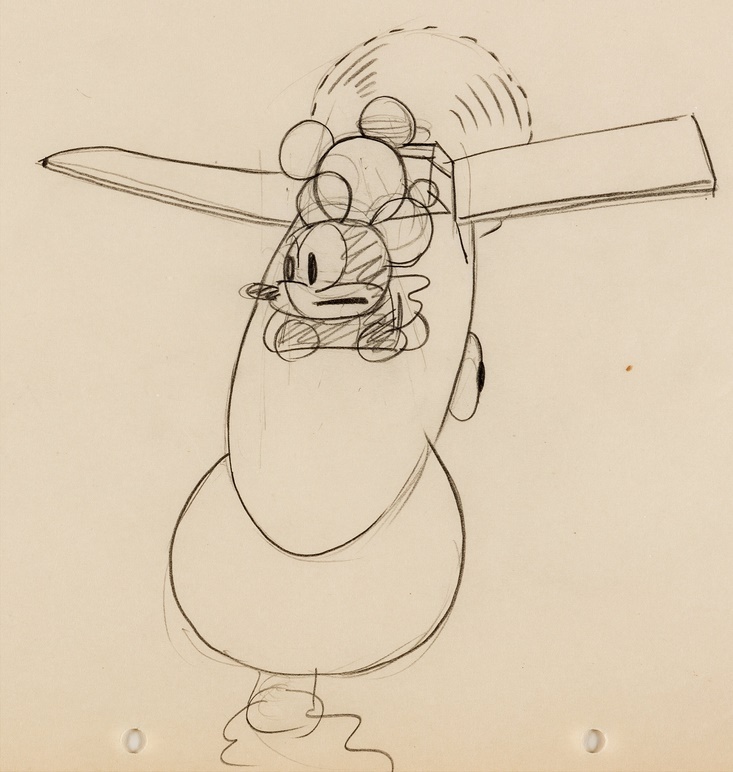 The two Ub Iwerks drawings feature Mickey and Minnie Mouse in Mickey’s home-made plane, and are estimated at $5,000+ each.